2011 FORMULA R1 Pair Brake Discs Black + 180/180 mm PM / IS All our brake discs are mounted, purged and ready to use, supplied with plates already mounted and a 2 year warranty. Formula R1 disc brake bike. 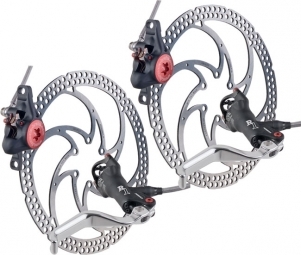 The Formula R1 brakes are lighter Formula range. The Formula R1 have forged lever master cylinder assembly. Less than 260 grams 160 mm disc, Formula R1 brakes are a must for the MTB Cross Country. Features Formula R1 brakes complete system: - Monobloc caliper in cold forged aluminum (6061 T6 heat treated) - Two 22 mm pistons with automatic adjustment - Master cylinder cold forged aluminum (6061 T6 heat treated) - Joint cup sets: patent based on the same principle used in Moto GP - Body master cylinder reservoir with patented built-in cooker - Forged aluminum lever - New record third generation combining lightness and thermal resistance - Flip Flop reversible lever for mounting to the right or left - Before by hose 100 cm - Back in hose 165 cm Complete system weight: 160 mm = 258 g front brake Post Mount adapter comes with av / ar IS Beware, if you are mounting IS front, consider ordering an IS 180 Front adapter.